Want to ward off bad luck, the evil eye, and bewitch a potential lover, all at the same time? The all-purpose heart motif, in ever-changing variations, fits the bill. Shakespeare, his fellow poets, writers of fiction, confectioners, and Hollywood‚Äôs movie moguls have all tapped into the idea circulated by the ancient belief the human heart is the seat of loving feelings. No one really knows for sure how and why that particular organ of the body became associated with St. Valentine, or how in Western culture, the bi-lobed shape came to represent sentiment and romance. Any first-year surgical resident can attest to the fact somebody really used their imagination in crafting the symbol that has come to represent passion and devotion. Recently, the ubiquitous graphic shape had the honour of being the first symbol to be included in the esteemed Oxford English Dictionary. Appropriated by advertisers and merchants to sell the public on everything from the health properties of margarine and pomegranate juice to where to spend your vacation dollars, the ideogram is ever present. The catchy ‚ÄòI love New York‚Äô advertising campaign, which began in the 1970s, is still evident today and needs no translation. Traditionally, engagement and wedding rings are worn on the fourth finger of the left hand because of the ancient Roman belief the vena amoris ‚Äì the vein of love ‚Äì linked it to the heart. In the early 1800s, Scottish Luckenbooth pieces or witches hearts had the bottom point of the heart curving sharply to the right and were thought to ward off evil spirits and keep babies safe from harm. Claddagh rings‚Äìwith their hearts, hands, and crown motif‚Äìhave for hundreds of years been the Irish symbol for showing romantic availability. 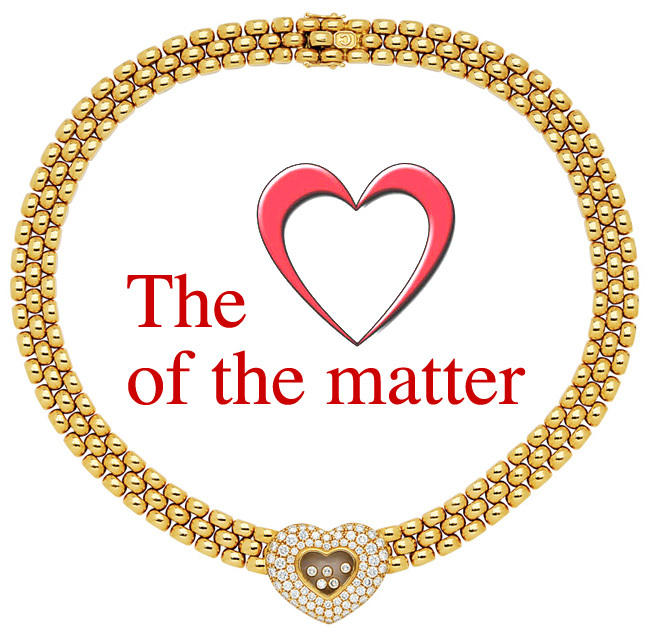 Worn with the heart facing away from the wearer, it indicates its owner is open to romance. In the mid-1760s, simplified rococo open hearts in silver or gold were outlined with a thin, narrow, gentle swirl of ribbons; white enamel was sometimes used to indicate purity. Seed pearls decorated monogrammed rock crystal lockets containing locks of hair. It may seem macabre but people were less squeamish about death and dying, and elaborate mourning rites and rituals accepted the transition from life to the beyond as natural. Fast forward a century or two to the iconic Elsa Peretti ‚ÄòOpen Heart‚Äô series for Tiffany & Co. crafted in platinum, gold, or silver and the latest filigree diamond pave hearts. Winged hearts were a popular theme in the Edwardian and Victorian eras‚Äìwings extending from a petite central heart, meaning love flies to you and from you. Double‚Äìheart, or sometimes triple‚Äìheart, brooches were decorated with the Biblical word mizpah, meaning ‚Äúwe are absent from one another,‚Äù and signified the bonds and remembrance of a parted loved one, either by distance or death. 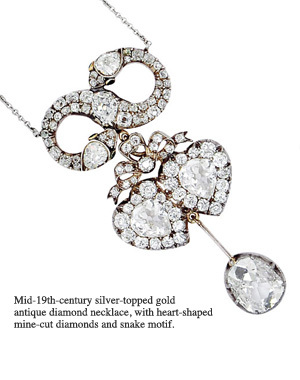 A pendant necklace set with heart-shaped, old mine-cut diamonds and an entwined snake motif in silver-topped gold from the 1850s could be suspended from a delicate chain. Continuing into the late 1800s, knife‚Äìedge bangle bracelets were decorated with colourful enamel hearts delineated with pearls and diamonds. From 1890 to 1905, gate chain link bracelets with heart‚Äìshaped padlocks featuring keys or latch closures were symbols of enduring love, often in 9-karat rose gold from England. Later, during the art nouveau period, heart-shaped plaque medallions were adorned with graceful nymphs wearing flowing drapery painted with iridescent basse-taille enamels. Edwardian festoon necklaces were set with precious gemstones or pastes on lacy pierced backgrounds, accented by a series of graduated heart-shaped drops. A modern version is a slender spring-mounted collar set with sunny yellow diamonds. 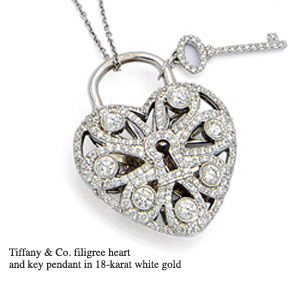 A simple bombe heart pendant from 1890 set with old-mine cut diamonds is separated by more than 100 years from the contemporary version, Tiffany & Co.‚Äôs filigree heart and key pendant. Much more extravagant is Faberge‚Äôs ‚ÄòHeart Surprise‚Äô frame, containing three hidden picture frames, the red enamel guilloche heart embellished with diamonds and tucked inside a typically opulent egg, a gift from Tsar Nicholas to his mother for Easter 1897. During the Second World War, pilots presented their favourite gals with sweetheart pins, airplane propellers, and wings within a heart. Peacetime Georg Jensen studio‚Äôs diverse styles included simple unadorned puffy heart pendants and openwork heart brooches decorated with dolphins, vines, and seashells. Surrealist artist and designer Salvador Dali‚Äôs 1953 ‚ÄòRoyal Heart‚Äô jewel was crafted of yellow gold with an eerily realistic pulsating centre decorated with rubies to represent life force and energy. Lately, the major contemporary jewellery houses have tapped into this desire for tangible forms of love. Van Cleef & Arpels has ‚ÄòSweet Alhambra.‚Äô Cartier has two versions: face-to-face Cs forming a stylized open heart and entwined hearts. Bulgari, Chopard, and Boucheron are also in the game of love tokens. Sold at auction recently is one of the most expensive heart jewels ever created‚Äìthe Cartier diamond brooch designed for the 20th anniversary of the marriage of Wallis Simpson and the former King Edward, which went for more than $300,000. 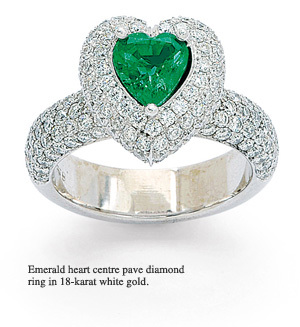 So if your client is heartbroken, cheer them up with a bejewelled heart. Worn on their lapel, finger, or neck, there‚Äôs no reason to lose heart when there are so many from which to choose.